Let’s look at a case study for the success of a small team: The United States Army. While it might seem like an unorthodox comparison, the Army highlights the importance of a small, focused team of dedicated members. The smallest teams usually undertake the most complicated and challenging assignments; although the army has enlisted more than 1.5 million personnel, Delta Force and SEALs continue taking up the most strategic and critical missions. Simply put, there’s nothing more admirable than the efficacy, inventiveness, focus, agility, and feeling of pride felt by a small team of talented and committed people who are willing to dedicate their resources and abilities to their team’s success. But, unfortunately, just like any other business entity, small teams have their fair share of challenges too. Sadly, it can sometimes be difficult for inexperienced first-time managers to manage a small team. Your preparedness fundamentally determines your ultimate response and overall success rate. So, to help you successfully manage your team, here are the top challenges you might experience, and their corresponding response strategies. While we continue to encourage companies to develop a culture of unity under a common vision, let’s face it—people are different, with varying personalities. This may not be as obvious in large teams, because the bond is significantly weaker compared to smaller teams. Managing a small team of workers is like leading a close-knit family. Everyone is so used to each other that you’re bound to deal with cases of some of the members annoyingly interrupting their busy workmates. To make matters worse, resolving these issues isn’t easy, because there are fewer individuals to dilute the effect of a troublesome or noisy team member. Over time, the workplace atmosphere may become uncomfortable—which can, in turn, affect team alignment, which affects the overall outcome of projects or tasks. So, how do you cope with such a challenge? The most effective strategy, of course, is to tackle the problem from the roots. Pay attention to work ethic and personality during recruitment, and most importantly, involve your team in the selection process. After all, 90 percent of employees believe that their seniors should seek their opinions before making critical team and company decisions. Of course, no matter how careful and observing you are, conflicts happen anyway—because we are all still humans. For these situations, it’s good to have a conflict resolving plan in mind that will help tackle the problem as soon as possible. A conversation with conflicted sides, both individually and all together, is a good start. 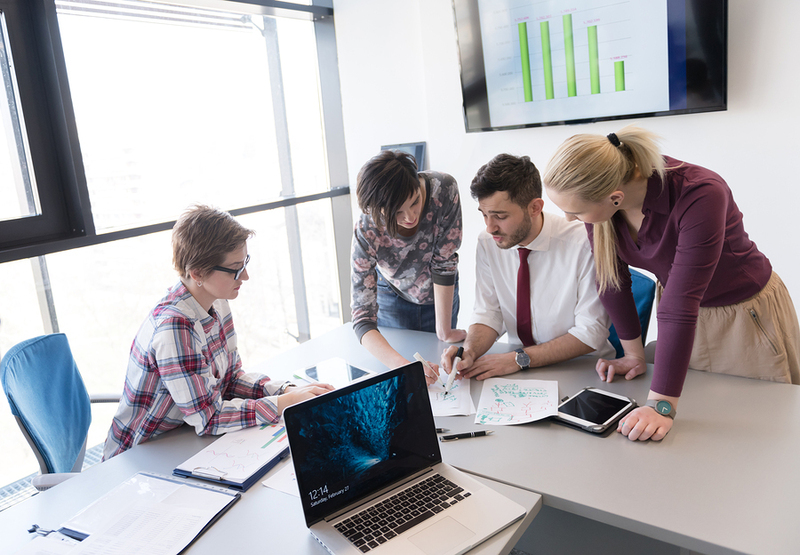 As a team leader, you have to make sure you listen to all sides and their arguments, which will make it easier to clearly define the problem and propose several different solutions, if possible. Individuals who work on smaller teams often need a more diverse skill set compared to their larger team counterparts, because they often have to take on multiple roles. For example, while large corporate teams might hire dedicated product testers, more often than not the product creators in smaller teams are forced to double up as testers. Of course, this gets the job done, but not as effectively as working with individuals with separate specialized roles. The reality is that when employees are forced to wear too many hats, it can actually be a hindrance to optimum productivity. Your employees will likely spend too much time looking to external expert sources for answers, resulting in a less efficient team. To overcome this challenge, be upfront and invite a discussion amongst your team members on critical specialized skills that may be missing. The solution might be a new hire, strategizing on a training plan, or pairing team members according to expertise or knowledge areas that supplement each other. Small teams can often find themselves swamped and struggle to get everything done with limited time. In most cases, such undertakings require all hands on deck, leaving almost no room for breaks and relaxation. While individuals on large teams can withdraw temporarily without affecting the overall outcome of a project, on small teams this is rarely possible. Over time, being overworked gradually demoralizes employees. According to a report published by Glassdoor, 64 percent of millennials would be happier making $40,000 a year at a job they enjoy, as opposed to raking in $100,000 at a job they don’t find interesting. So, it’s important to make sure that your team isn’t working so hard that they begin to dread the arrival of Monday. To combat overwork, make sure you have a clear system in place for handling assignments and tasks. Relying on project management tools and software to schedule and organize operations can streamline workflow, subsequently making goals more achievable in reduced time. People come and go on teams both small and large, whether it’s only for a few days or permanently. A team member may get sick and be forced to stay home from work, or perhaps they planned a holiday and have taken a few days off. Or, worst case scenario (for you as the team leader, at least!) they have found another job or have been let go. These are all normal things that happen in all working environments. But, the problem is, when a team is big, one team member missing isn’t such a big deal because there are others who can “cover“ for them. In small teams, where everyone has their particular skill set, assignments, and tasks, it could present a challenge for both the team leader, as well as for the whole team. It’s best resolved with good planning and preparation. If the reason for someone missing is planned vacation days, you will have time to prepare for it and rearrange that person’s task among other team members, since paid leave has to be announced up front. This plan of action will help when there’s an unexpected absence, like sick days. Talk to the team members about possible scenarios up front and determine who could take up on other person’s tasks in case they are away. Whatever the challenges your small team is facing, it usually comes down to good organization and conversation with team members. As the leader, it’s your job to know your team members well, know what each of them is best at, and listen to problems they might be having. In addition, it’s necessary to create a system for organizing tasks and assignments, so everyone knows what they are in charge of and no one is overworked. It’s also good to have an action plan for resolving conflicts, and one for rearranging assignments when some member of the team is missing. Listen to your team members, discuss tasks together, and don’t forget to have some fun now and then as well.